Primrose stocks a large range of solutions to your spider problem from ultrasonic spider repellents to spider catchers and sprays. 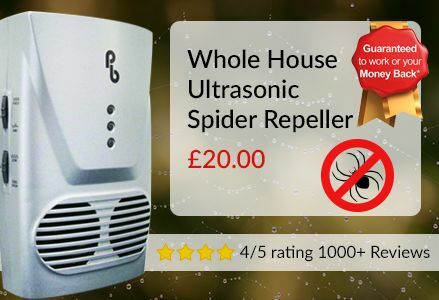 Highly recommended come our whole house ultrasonic repeller - a permanent solution to your spider problem. It works by emitting ultrasound, inaudible to humans, but detectable by spiders, causing them to flee the area. Our product also uses electromagnetic technology, which is believed to upset spiders magnetoreception - affecting its ability to navigate. 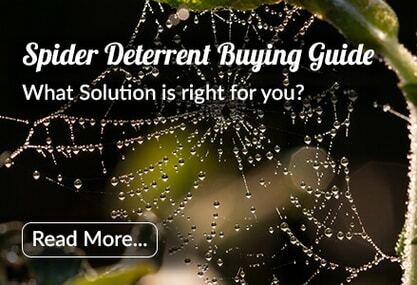 Spider repellents & deterrents are designed to repel spiders from a particular area. Solutions include ultrasonic repellers, spider spray, spider catchers and glue traps. Ultrasonic repellers work by emitting high frequency sounds, inaudible to humans, but detectable by spiders, who have tiny hairs that vibrate in response to sound. Spiders use these hairs to detect flying insects and it is likely ultrasound disrupts this function causing spiders to leave the area. Spider sprays prevent spiders making webs in problem areas, while catchers can be used to remove spiders without the need to touch them. Glue traps can be extremely effective at keeping small spaces free from spiders, but should not be used in communal areas with children and pets.